In DCOM Config, under COM server \ properties \ Security tab \ Launch and Activation Permissions. Chose the Customize radio button;  added the IIS Application pool account giving it full permissions. Thought I'd post this in case anyone has clients who would prefer not to use an admin account for security reasons. You don't need an Administrator account, just any account will do as long as you add it to the DCOM launch permissions. The Application Pool Identity is a generated account that's specific for each individual Application Pool, so it's very tricky to set permissions for. Even if you manage to get it into the DCOM permissions you will have a hard time trying to get it to work with local file permissions because the account doesn't show up on the ACL list. Ok I see there's a way to do this by using IIS AppPool\AppPoolName as the account name. 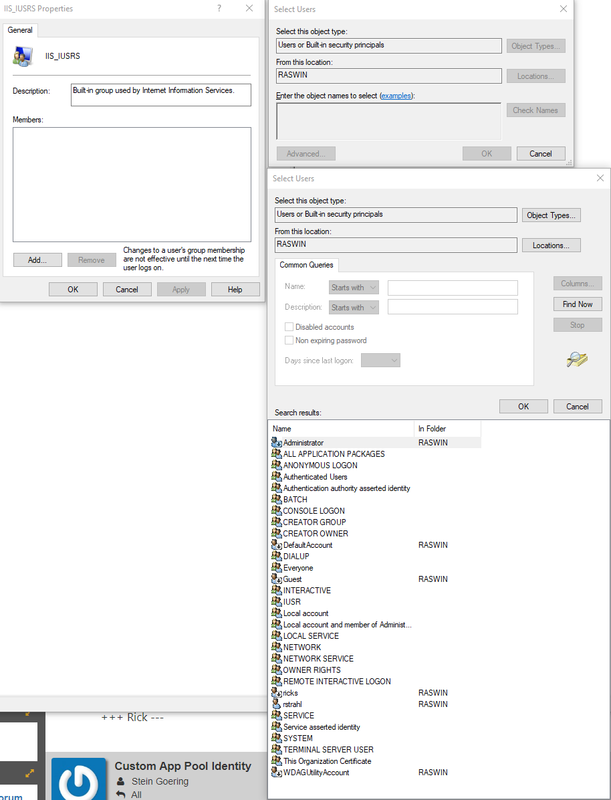 This approach lets you create permissions at the file system as well as adding a group and even in the DCOM settings. That last part is what I've been missing. We would add a custom account as the Application Pool Identity via the Advanced Settings App Pool dialog, and then set the DCOM Identity to the Launching User. We would make that custom account an admin t because I somehow thought that was required by the .NET Handler. So never had considered changing the DCOM launch permissions until this customer objected to giving it admin privileges. I didn't mean to confuse the issue by using the term "IIS Application Pool account" - I just meant to reference that custom account we set up, not the internal ApplicationPoolIdentity. You can use any account for DCOM as long as you give it access permissions. By default only Administrators, Interactive and SYSTEM have the ability to launch COM objects. Any other accounts - including NETWORK SERVICE - require that they are added to the DCOM permissions.